Today marks the 129th anniversary of Cliftonville’s first ever fixture at Solitude. 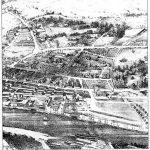 Though the area we now know as the Cliftonville Road and its surrounding environs, including the Waterworks, were habitually referred to as ‘Solitude’ by locals for more than a century prior, it was not until October 19, 1889 that the Reds made their bow at the venue we know and love today – the only stadium remaining from Irish League football’s inaugural season the following year. 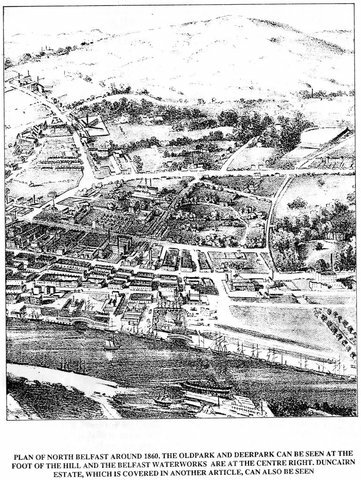 Having purchased the ground in 1888, the Club – who didn’t officially move from the adjacent cricket pitches until 1890 – welcomed Milford for an Irish Cup game which, by virtue of an 8-2 success, was also Cliftonville’s first win at the new site, where a further 1000 home successes have subsequently been recorded; last month’s 3-1 defeat of Ards marking another grand milestone in the history of Ireland’s Oldest Football Club. 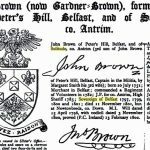 The first opposition goalkeeper to play at our ground (and who conceded those eight goals on this day in 1889) was Milford custodian William McCrum, the man who would later go on to invent the penalty kick – a particular irony given that the first ever spot-kick in international football was taken at Solitude, where Linfield and Ireland’s Sam Torrans saw his effort saved by England goalkeeper William Rowley, who also repelled William Dalton’s rebound at what was then Ireland’s national stadium. Over the years, many stories have circulated about precisely where our home got its name – from the unkind 1960s jibes of low crowds to the more accurate surmisal that it was, in fact, named after a long-gone house that once stood in the vicinity. 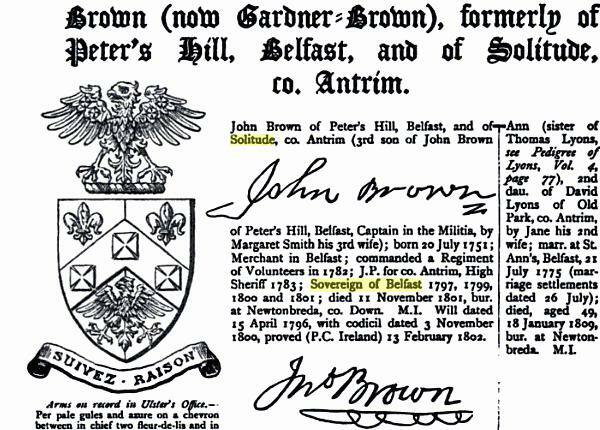 Situated one mile from the edge of the town and derived from the name of an ancient tribal fort, the land in the area had been known as Solitude since at least 1785 when the property, which formed part of the Oldpark Estate, was acquired by a wealthy businessman – John Brown, High Sheriff of Antrim and the first Sovereign of Belfast. He built a house on the land and gave it the same name. The precise location of the building has been the subject of much debate and disagreement in recent decades, with many under the mistaken (albeit somewhat romantic) impression that it was, in fact, what we now know as the Whitehouse pavilion within the stadium. In reality, however, the truth lies a few hundred yards away. 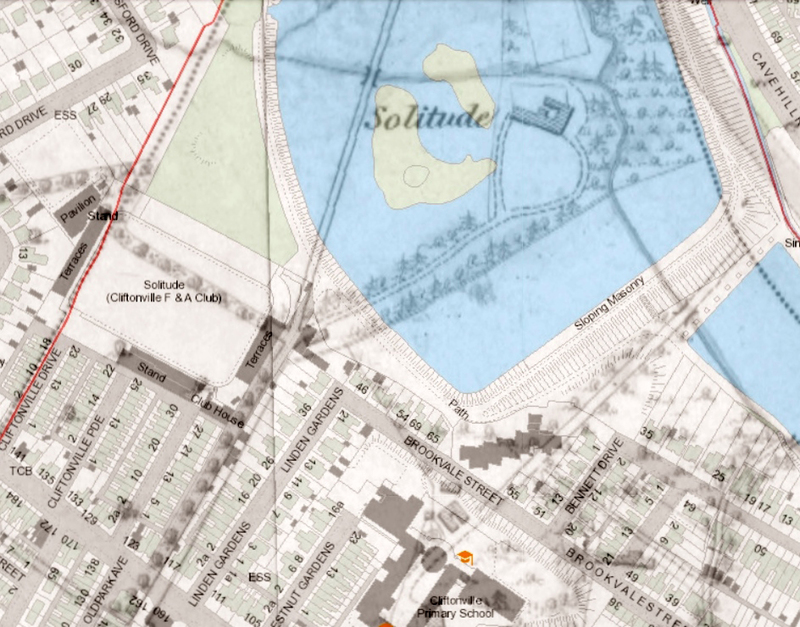 Using the first Ordinance Survey map of Belfast from the 1830s overlaid on a more recent update, the location of ‘Solitude’ can clearly be seen, just to the right of the two islands in the top pond of the Waterworks. 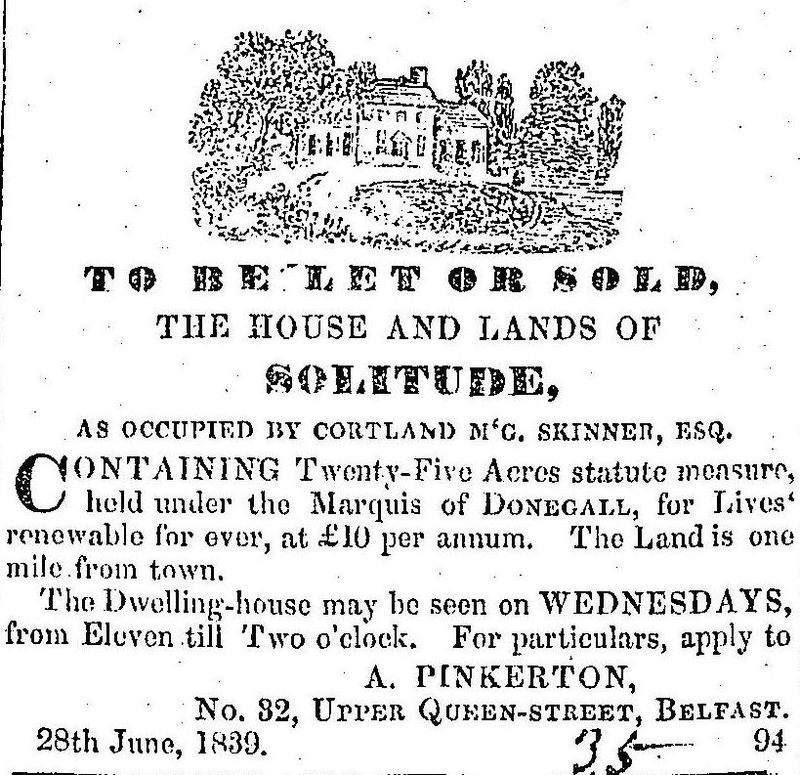 What was a very substantial dwelling was later sold by a Mr Andrew Pinkerton in 1839 and subsequently demolished by the Belfast Water Commission to make way for an increase in the growing town’s water supply. 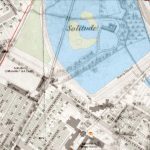 By the time Cliftonville Football Club’s ground was being developed on its present site some 50 years later in the late 1880s, the name ‘Solitude’ was still alive in locals’ memories and duly stuck when the Reds moved from their original home on the Cliftonville Cricket Pitch, now more familiarly used for GAA. 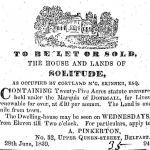 One of the oldest stadia in the world, Solitude remains the oldest football ground in Ireland and you can read the story of its fascinating history by clicking here. Get the shirt off their backs!